Certain events or occasions or just different moods of people, in general, are displayed appropriately through simple short messages displayed on things like cars. Car or vehicle bumpers provide first eye contact with the viewers and a great canvas for funny, mood boosting messages to be displayed on them. Go Stickers have developed expertise in the sticker industry through decades of service and produce Funny Bumper Stickers for all kinds, sizes, and shapes of vehicles using the most reliable and advanced materials that are processed and printed using our high-tech advanced equipment handled by some of the most skilled people in the industry. Our market leading wholesale bulk price offers also include free on-site delivery for our clients and no extra costs for the printing or cutting equipment as well. 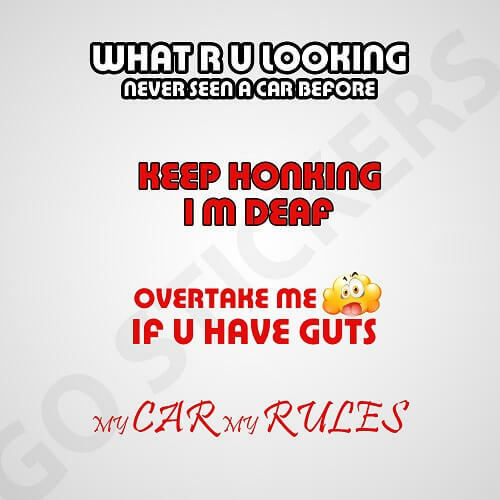 Funny Bumper Stickers are the perfect choice for vehicle owners who want to get a charming and funny message to everyone who might see their vehicles. These funny messages can range from the humorous witty ones based on generalized humor to certain event specific funny lines or smiley faces that are perfectly quirky and even sarcastically humorous and induce immediate smiles on everyone’s faces. 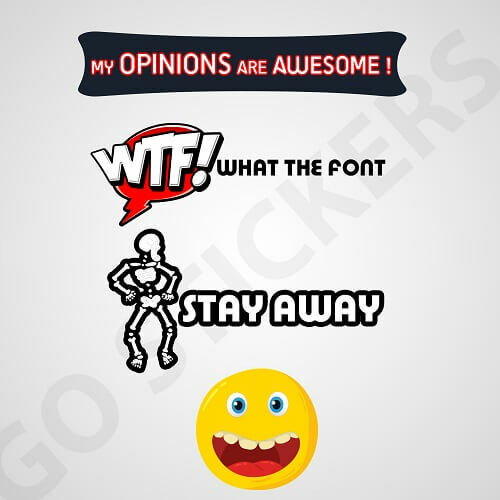 These Funny Bumper Stickers from Go Stickers who are the most reliable stickers company in the US are vinyl-based decals that are either graphical or textual representation of the vehicle owner’s moods and feelings towards certain events or people in general. These can also be applied using magnets on bumpers that can serve the purpose very well for short-term temporary basis. Go Stickers are the most well-developed and experienced vehicle stickers company in the US and have developed certain sourcing and distribution channels along with state-of-the-art manufacturing facilities that help us cut all the unnecessary costs down and enable us to offer the most dependable Wholesale Funny Bumper Stickers to our car accessories retailer clients. The lowest bulk stickers prices from Go Stickers are designed to maximize the profit margins for our clients and enhance their business profits at the same time as well. Go Stickers doesn’t compromise on quality regardless of the number or quantity of Funny Bumper Stickers you might want, we use highest quality materials and easiest application methods while using adhesives of the highest quality that don’t leave any residue on your vehicle bumpers at all. When it comes to vehicle bumper stickers of any kind including the Funny Bumper Stickers, their customization and personalization are the first concern people generally have. They are required to be customizable in a way that vehicle owner are able to convey their own personalized messages across people. Various businesses might also need to display their own business names and logos on their trucks or vehicle’s bumpers using Funny Bumper Stickers in a witty way. Go Stickers keep all these requirements in mind when designed our high-quality stickers. 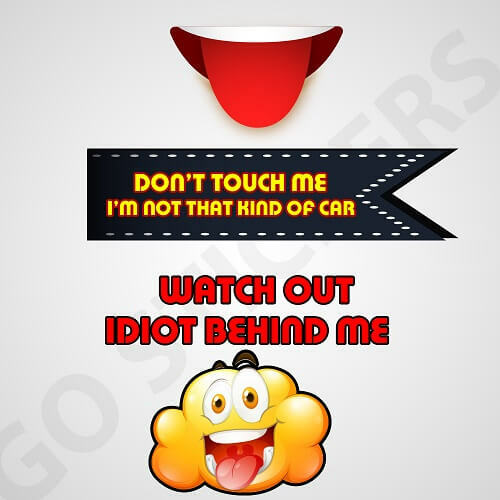 The Funny Bumper Stickers by Go Stickers are able to display whatever kind of funny or witty messages vehicle owners want while keeping them highly readable using highest quality inks and high contrast color combinations as well. Go Stickers having over two decades of experience in the vehicle stickers industry, have gained knowledge of the highest level and are aware that different vehicles including cars, trucks, family cars, buses or vans, have bumpers of different sizes. The Custom Funny Bumper Stickers by Go Stickers come in all size and dimension options that perfectly fit any kind or type of vehicles bumpers. The Funny Bumper Stickers by Go Stickers are manufactured using the highest quality plastic hybrid materials that can be the shiniest or the dullest matt finish depending on the vehicle owner’s preferences. Whichever materials you choose, the bumper stickers by Go Stickers will provide long lasting flat stick that will not leave any residue when removed as well. If market leading wholesale prices on the highest quality Custom Funny Bumper Stickers is what you are looking for, Go Stickers have the perfect solution for you. We offer cheapest bulk prices for bumper stickers that are made from highest quality materials that are processed on the most advanced equipment. Additionally, we also offer free delivery on bulk orders and no extra costs like the printing plate or the cutting die charges as well.